This is “ANKLES AWEIGH” an original MUTOSCOPE arcade card from the 1940’s. The art is done by the most talented pin-up artist of the era, GIL ELVGREN. This GLAMOUR GIRLS card is rated “VERY RARE” by the knowledgeable folks at Mutoworld. The card is a lithograph on heavy card stock and measures 5 1/4″ by 3 1/4″. This item is in nice shape, with some very minor edge and corner wear. A very slight corner crease on the upper left. No imperfections on back. Keep in mind the large image is enlarged by TWICE the size of the original card. Quality cheesecake from when the pin-up was in its’ heyday. Categories: ART, PRINTS & PORTFOLIOS, PAPER PRODUCTS, MISC, TRADING CARDS. Tags: collectibles, Glamor Girls, Glamour Girls, Ankles Aweigh, art, cheesecake, Gil Elvgren, illustration, mutoscope, mutoscope cards, pin up, Pop Culture, vintage girls. 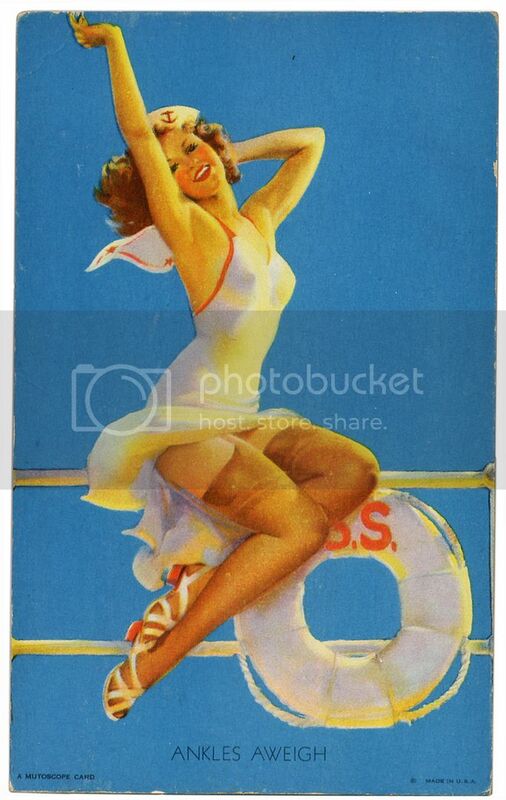 Be the first to review “ANKLES AWEIGH Gil Elvgren CHEESECAKE PIN-UP Mutoscope Card VERY RARE (1940’s)” Click here to cancel reply.